In the check-out area of your website, many of your website settings come together. If you would like to change something in your check-out area but aren't sure where to make the adjustment, have a look at this article and find out where to amend which section. 💡 Note: It is currently not possible to book multiple rooms or units in the same booking path. If a guest wants to book more than one room type or unit he will need to make a separate booking for each. Check-out URL 💡 Note: Only the marked section can be changed. If you are not happy with the URL of the checkout e.g. because it mentions your name, you can change part of it (see screenshot). To change this part, you need to go to your Settings section, and into Domain. Here you can amend the prefix of your .lodgify.com domain which is the part that will appear in the checkout URL. (Step 3) If you have add-ons configured for any additional services, they will appear in Step 3 of the check-out process. To make amendments, go to your Rates section. For more details see Create add-ons. 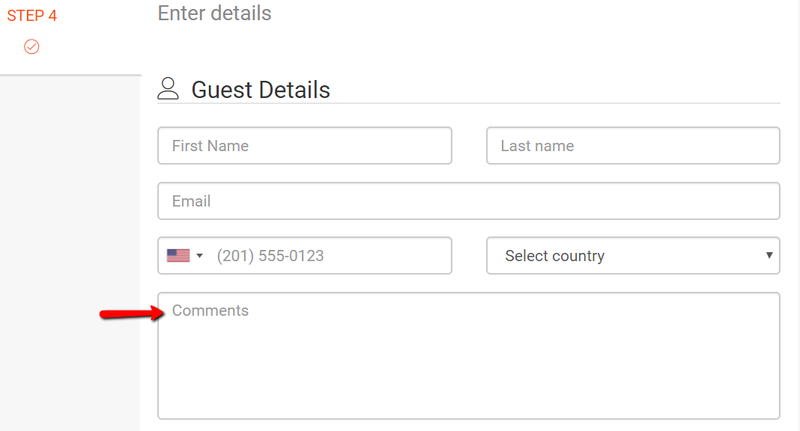 (Step 4) The guest detail fields are predefined and no additional or custom fields can be added. You can only change the description inside each field, i.e. change "Comments" to "Guest IDs". To do this, use the Custom Translations Tool. For more details see Customize texts and buttons. The spoken languages can be amended in the Property Contact information / your Account profile. For more details see Add or edit property contact. 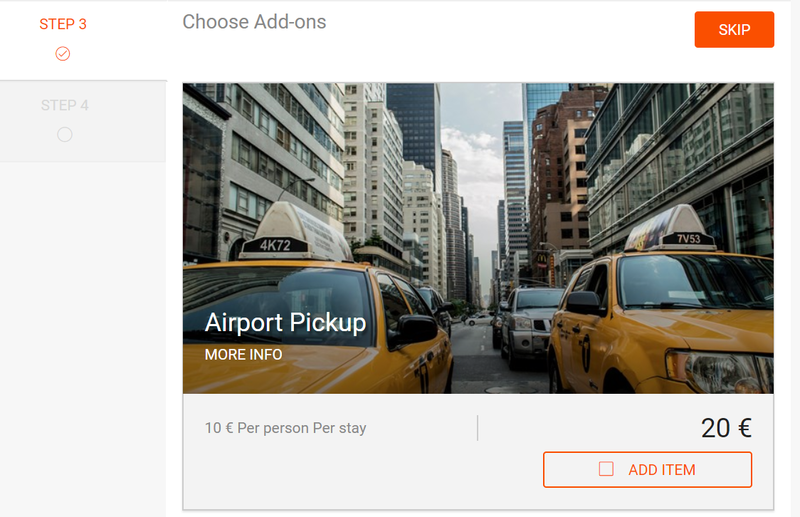 💡 Note: Payment options will only be visible directly if you accept instant bookings. You can only amend which gateway appears, but not the design. Paypal: Shows the payment options and guides the guest to the Paypal portal once he clicks "Confirm & Pay". 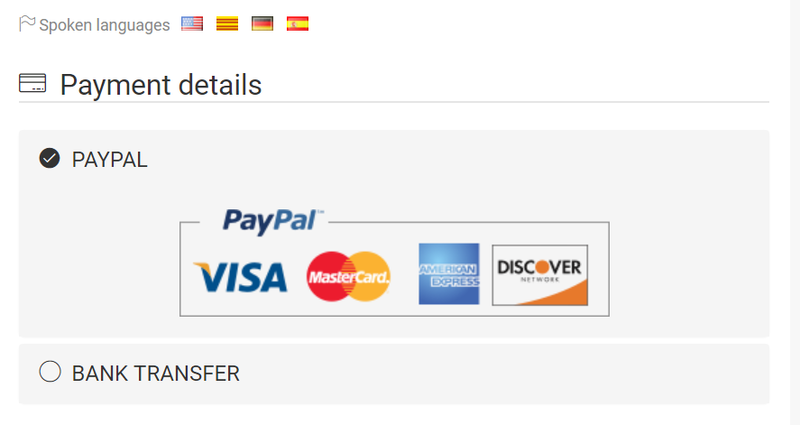 Bank Transfer: Will send the bank account details with payment instructions in the confirmation email. See how to amend the email content. To change your payment gateways go to Payment Settings. If you don't accept Instant bookings you might have a reCaptcha key enabled to protect you from bots and spam. To disable the feature go to your Apps section. Find out more about the reCaptcha function. Change the rental conditions in the Rates section under Rental Agreement. There are three options depending on your bookability settings in the Rates section. For more details see Booking conditions. 💡 Note: To change the wording of the button, use the Custom Translations Tool. For more details see Customize texts and buttons. The picture and address can be amended in Map & Gallery. Find out how to Configure the address and custom city. The picture is the first photo in your gallery section. See how to change the order of the pictures. 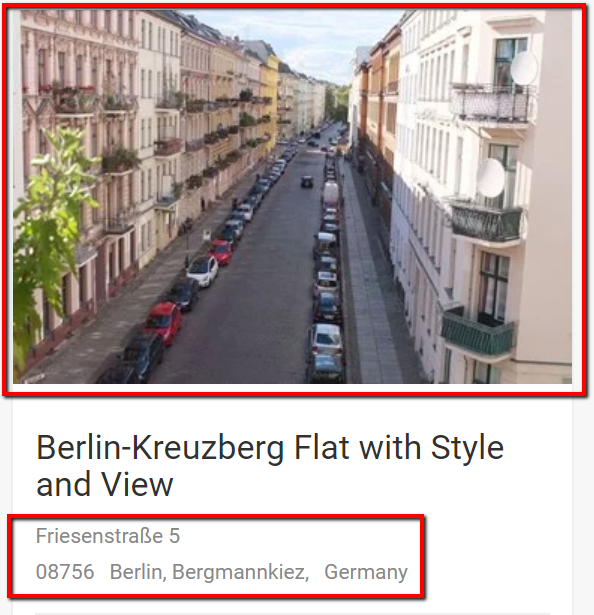 💡 Note: If you have several room/rental types, the picture will be the first one of the section General Property Photos. 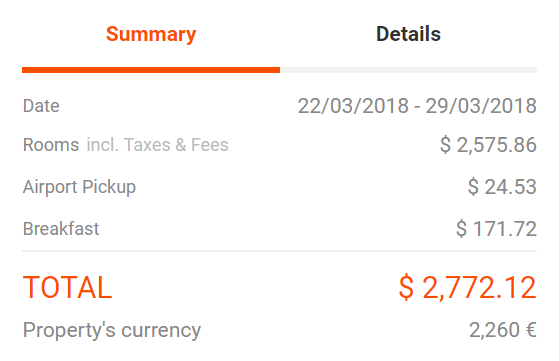 Room costs (including taxes & fees). To see the costs split up, go to Details. 💡 Note: The currency shown on the website depends on the location of the guest's IP address. If you want to limit it to the property's default currency configured in your Rates section, please contact our support team. If the guest's currency differs from the property's default currency, the Total will also be shown in the default currency. Payment schedule The payment schedule shows when the payments are due according to your Policies. Find out more about How to set up your payment schedule. Promotion code If a guest has a discount code he can fill it in here. You can configure and amend your promotion codes in your Rates section. Find out more about Promotions. 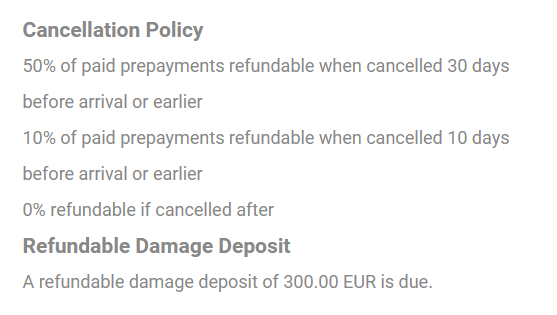 Your cancellation conditions can be changed in your Policies. Find out more in Set up your booking and cancellation policies. Currency & Language The guest can always change to another one of your website's configured languages or select to see the booking summary and details in a different currency for clarification purposes. 💡 Note: This will not change the currency you will see in the quote in your reservation system. To change the default currency for the property you will need to amend it in the rates settings of each property.